Random And Some: "People need a reason to believe they're all still here for something"
"People need a reason to believe they're all still here for something"
I stumbled upon Where Things Come Back via this awesome list on fellow book enthusiast Emma's blog Her Nose in a Book. Instantly I ordered several titles on her list, and it was John Corey Whaley's debut novel that arrived first in the mail. I'm glad it did. Cullen Witter is a regular 17-year old boy from Lily, Arkansas. Benton Sage is an 18-year old missionary in Ethiophia. By no means do their lives appear intertwined, but when Cullen's brother Gabriel disappears, and the mysterious Lazarus woodpecker allegedly returns from extinction, the two boys prove to be very connected indeed. The concept of two storylines is interesting and very well-executed. I also liked how Whaley perfectly describes the stages of grief Cullen's family goes through. 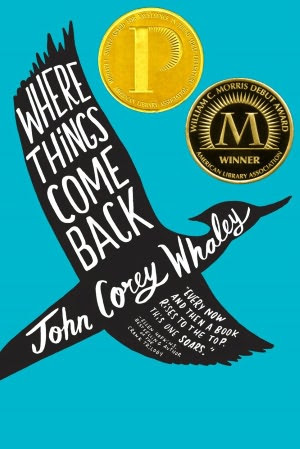 Overall, Where Things Come Back is a clever and hope-filled tale about second chances.